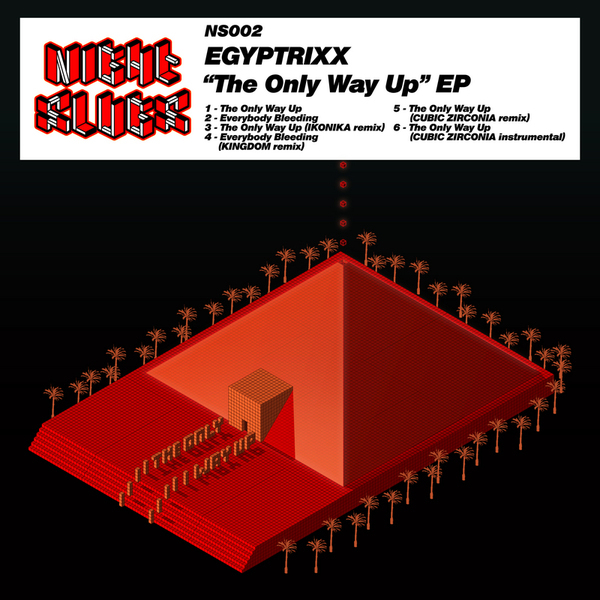 Keeping it fresh and righteous, London's Night Slugs crew continues to make all the right noises with this second release proper on the label, a debut from Toronto's Egyptrixx. "The Only Way Up" opens this 6-track digital edition and is just immense, a manipulative mix of a slow beat count with combustible percussion, all fluttering rimshots and squeezed synths slowly luring you into a world of rugged machinations and squashed funk - an oddly engrossing mixture that we havent been able to stop listening to all week. "Everybody Bleeding" is more up-fer-it and relentless, deploying a shuffling peaktime riddim with demented synth-spots and pitch-shifted stabs riding alongside a nicely obliterated House vocal - proper mongrel styles. This edition also features remixes from Ikonika and Kingdom, the first teasing a tight Funky riddim out of the title track, the second injecting 'Everybody Bleeding with a darkened Soca swing and a more controlled progression - big big tune. Excellent wares - don't miss!